The Smarter Cities Challenge deploys top IBM experts to help cities around the world address their most critical challenges. IBM do this by putting teams on the ground for three weeks to work closely with city leaders and deliver recommendations on how to make the city smarter and more effective. The Smarter Cities Challenge is IBM’s largest philanthropic initiative, with contributions to date valued at more than $66 million. 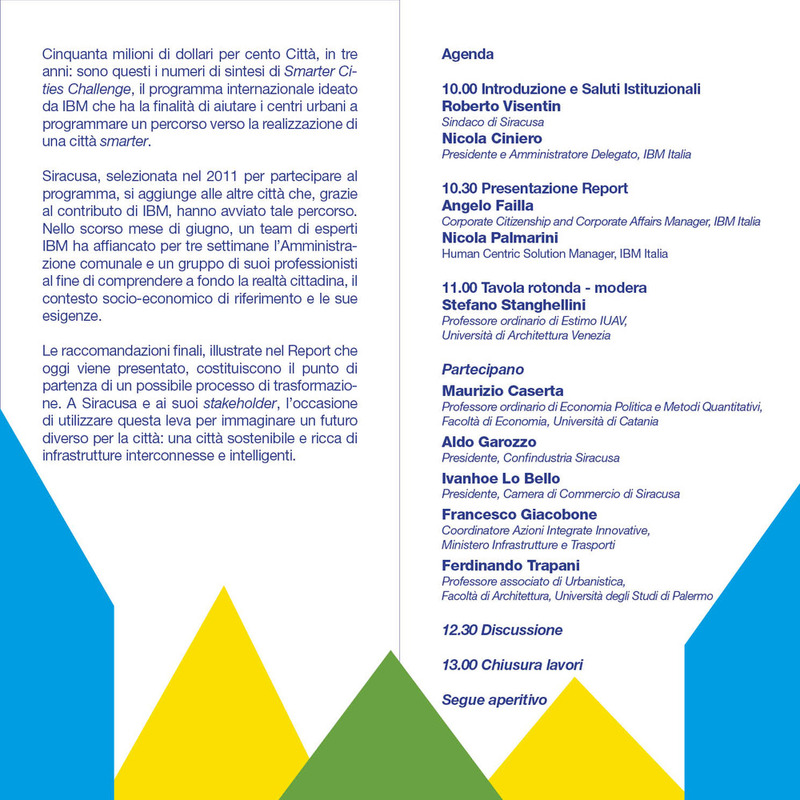 Since 2010, IBM has deployed 800 top experts to help more than 130 cities around the world. In 2015, the program’s fifth year, IBM awarded grants which will be deployed through 2016. Many of today’s cities are suffering from years of disinvestment in basic infrastructure, and especially technology infrastructure. These gaps, due in part to budgetary pressure but also to the regular turnover of leadership, have kept cities, their leaders and citizens from realizing their full potential, slowing economic development and constraining their ability to make informed, data-driven decisions. Smarter Cities Challenge engagements all over the world are demonstrating how the right investments in infrastructure can introduce long-term efficiencies and dramatically transform a city’s prospects for growth. 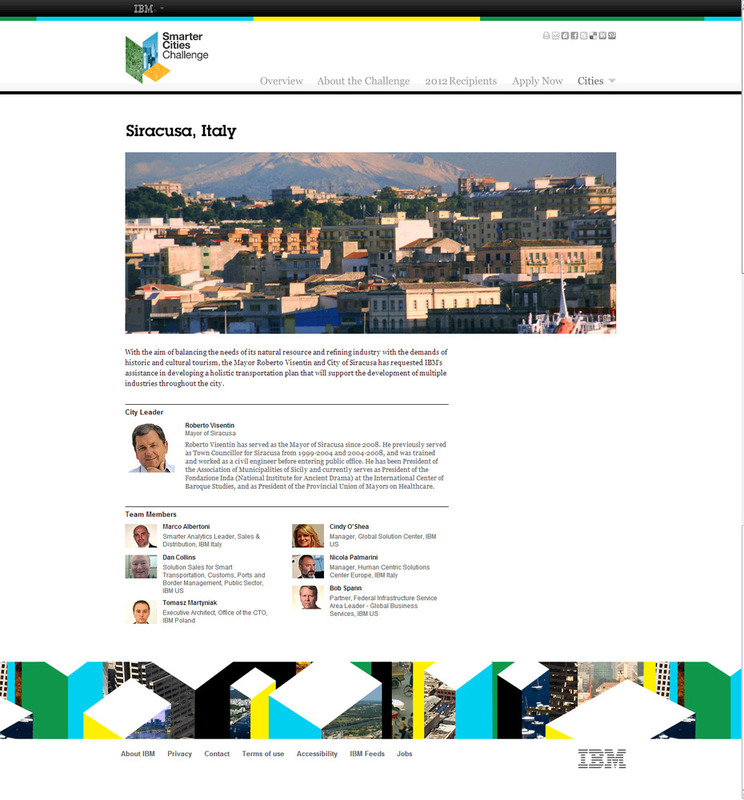 Within my role of IBM Smarter Cities subject matter expert I have selected to be in one of those teams along the month of june/2012 within the city of Siracusa, Italy. It was and still it is an amazing experience having the chance to meet both experts from all over the world with visions and experiences different from mine, but also to get inside a city life, its background, its story and overall its dynamics. Working face to face with local teams was one of the greatest value I’ll bring in my personal and professional experience, because there is no other way to understand the concept behind “Smart City” but living and building the Smart City itself. This highlight one main consideration. Despite the concept of replicability which is by far is one of the crucial point to speed up the growth of cities, each city has its own soul and its own “smart” dynamics which is mainly given by a corpora of factors that can be embodied by the citizens (and the visitors) themselves. So what i am introducing here is the concept of a “psychology of a city”. Or how the collective behavior of citizens influence the perception of the city itself. A phenomenon explained in its best way by James Hillman and Michael Ventura in their masterpiece “We’ve had a hundred years of psychoterapy and the world’s getting worse”. Something I started working on 2012 that tried to go further the classic recipes “10 ways to…” and explore the deep reasons who involve citizens and visitors to take (or not) actions and show their empathy for a place, which I believe is the ultimate reasons to transform cities in their smart twin. This research lead to the project Love City Index, launched in 2014.